Summer is over, the weather is cooling, and the leaves are about to fall. Take the opportunity to revitalize your lawn so your backyard will be better than ever next spring! 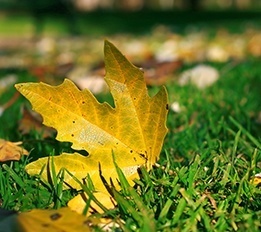 Here are some helpful tips for fall lawn care. You may have adjusted the height of your lawn mower in the summer to decrease the amount of heat stress on your lawn. If that’s the case, the temperatures are dropping again, so remember to set the mower deck back to normal. Cutting grasses back to two inches ensures that they’re too short to become matted under leaves and snow, but long enough to establish roots and discourage weeds. While the weather tends to cool off in the autumn, there may still be a few hot days left in the year. If so, hydrate your lawn once or twice per week, long enough that the soil several inches down has been drenched. To avoid evaporation and fungal diseases, water your lawn in the morning. All cool-season grasses, including ryegrass, bluegrass, and fescue, need to be fertilized twice in the autumn as well. These grasses will green earlier and look better in the spring if they’re fed at both the beginning and the end of the fall season. Overseeding warm-weather lawns with ryegrass is an extra step you can take to guarantee the health of your turf throughout the winter. Begin this process by once again adjusting your lawn mower; you’ll want to cut grasses back to one and a half inches. Get rid of the clippings then plant the ryegrass seed, completing two passes at right angles to one another. This is a good technique to try if thinness or large dead patches are plaguing your lawn. When overseeding a lawn suffering from these problems, water the area of land being treated continually. Initial frequent, light sprinklings can gradually be decreased; longer and longer intervals between doses of water encourage the lawn to harden and take root. Another way to address a lawn’s bald spots involves purchasing a mulch product containing seed and fertilizer. Take care of these dead patches in the autumn so that weeds are less of a problem and seeds have time to grow before the cold weather sets in. Another alternative is to lay sod. Look for quality sod, which is dense and weed-free. Thanks to fall’s comfortable temperatures and ample moisture, sod thrives in the type of environment created at this time of year. Protect your lawn by taking the time to inspect it for thatch this season. Thatch is a problematic layer of dead organic material combined with plants caused by overfeeding or overwatering. If you find one half inch of thatch or more underneath your lawn, your grass is especially vulnerable to disease, insects, and damage caused by extreme temperatures. To determine whether the layer of thatch below your lawn is too thick or not, remove and study a small section of grass and soil. If you do indeed have a thatch problem, don’t worry; there are solutions available. Use a power rake or vertical rake to break through to the layer of thatch and cut out unwanted debris. A hand rake is an effective tool for transferring the thatch from the ground to the compost pile after other implements have finished the dirty work. Interested in a way to combat thatch, increase drainage, and loosen soil? Aeration may be a suitable process for your lawn to undergo. Select an aerator capable of removing mounds of soil from the lawn instead of merely digging holes in the turf. Cool-season grasses can be aerated in the fall while warm-season grasses can wait until spring. Meanwhile, adding a top dressing can improve your lawn by thinning thatch, increasing the amount of organic material, and evening out bumps. One quality top dressing formula combines equal parts loam, sand, and peat. After you’ve dethatched and aerated your lawn, spread a thin layer of this formula over the grass then rake it into the ground.